Mark Zuckerberg, the multi millionaire founder of Facebook, the social network website, has announced a $100million dollar donation to Newark’s crumbling public education sector. Much of the media attention on the story has focused on how the donation coincided with the release of The Social Network, a film based on his life story that casts him in a negative light. What seems to have escaped most of the mainstream media is the much larger ramifications of a public city school system being reliant on a private donation from an individual to help meet funding requirements. The statistics for the school system, with 46% of students failing to finish high school and only about 40% have basic reading and writing skills by the third grade (aged 8), leave no doubt about the necessity for money to be pumped into the system. But what does this say about the state of the public sector in the USA if the largest city in a major state (New Jersey) cannot function adequately without such a massive private donation? This question is particularly pertinent with the rise of the so-called Tea party movement, named after the 18th century rebellion against King George’s tax collectors in the colonies. Back then the slogan was of “no taxation without representation” with the premise that if citizens were to be taxed, they should have a say in their governance. The modern movement disregards this representation aspect and bases its action on the premise of no taxation full stop and eliminating government provision of public services. Already US citizens pay less tax than those in Europe and the legacy of this can be seen in the crumbling infrastructure and budget crises that have hit many states, of which the bottom of the pile in terms of state spending per student is California. The current budget crisis in California has been well documented and is a legacy of tax cuts over a generation coupled with a crash in an overheated housing market. These have caused effects as diverse as the closing of parks and battered women shelters to police in Oakland no longer having the resources to answer emergency calls for burglaries and runaway children. That this situation exists in a state that on its own ranks as the eight largest economy in the world is a ludicrous situation. Yet the state government is paralysed and no action can be taken due to the requirement for all legislative actions on revenue and budget to be determined by a 2/3rds majority, resulting in a minority being able to block budget reforms and starve the state in an attempt to push it towards privatisation. The budget crisis and the paralysis in the state capitol Sacramento has meant that the state school system has taken huge cuts. California Community Colleges system faces cuts of $520 million, California State University $66.3 million and the Oakland Unified School District is expecting budget cuts of $110 million over the next 2 years. The cumulative effect of these cuts is the lay off of 22,000 teachers state-wide. And this is without taking into effect the cuts at the highest profile state institution, the University of California (UC) system, with its 159,000 undergraduates, 90,000 staff and 13,335 faculty members spread over 10 campuses, including UC Berkeley and UCLA. Although here, in a microcosm of the financial crisis as a whole, the cuts have been exacerbated by a clearly lopsided and at times, wholly unnecessary distribution of the burden. Students have had to endure tuition fee hikes of 40%, while staff, faculty and custodial workers have been given compulsory furlough time or lost their jobs. Whereas tuition has gone up, class numbers have gone down and class sizes have increased, causing some students to have to delay graduation while trying to complete their assigned units in time, leading to further financial burden as they then pay to stay an extra term. The UC Regents, the governing board of the University of California, blamed cuts from the state budget as responsible for the tuition increases yet these cuts were much less savage than faced by other, less high profile, education centres, amounting to only 3% of the annual UC budget. The tuition increases at the UC system caused particular anger amongst students because so much of the pain was actually self-inflicted and could be remedied. The UC endowment stood at nearly $8 billion for 2009-2010, yet the Regents argued the money could not be used to see them through the budget crisis and that tuition fee increases were necessary. There are a record number of construction projects on campus, which are being funded by bonds secured against student tuition fees. This has lead to a situation where tuition fee increases keep interest rates low on the bonds. In a similar financial situation, incurred due to the current recession, private institution Harvard opted to suspend construction rather than increase student fees, their approach in stark contrast to the public UC system’s. Other misguided priorities include athletics, with the UC Berkeley athletics programme alone having overspent by $7 to $14 million each year since 2003. While students and workers feel the sharp end of the knife, the UC President, Mark Yudolf, a man who in his own words got into higher education by accident was paid $828,000 in 2008-9. And he is just the tip of the iceberg. Between 1997-2007 undergraduate numbers increased by 39%, yet in the same period UC executives and senior management grew by 114%, costing the UC nearly $8 million extra annually in administration costs. The UC system, while having tuition fees that appear eye watering in European terms, are still considerably lower than private institutions in the US. But rather than keep the UC system fees low for Californian tax paying residents, the Regents seem determined to squeeze every penny from students by closing the gap between public and private University tuition fees, increasingly putting higher education out of the reach of low and middle income Californians. The mismanagement and apparent drive to push the UC system to enforced privatisation have fuelled student and worker anger and have led to several protests and demonstrations against the cuts to public education. 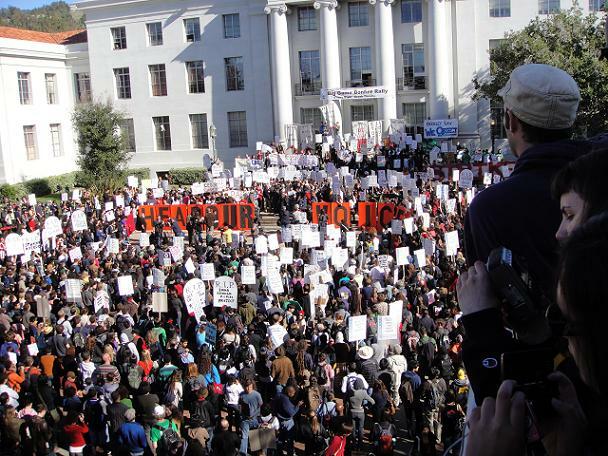 Last year, in the most high profile action against the budget cuts and tuition hikes, buildings were occupied at several UC campuses, including the symbolic Wheeler Hall at UC Berkeley, site of previous student sit ins and demonstrations. The Wheeler occupation was met with an overwhelming police response, who surrounded the building with both armed riot police and swat teams, while the students inside barricaded themselves in. Hundreds of students formed a human shield around the building to prevent the police from arresting the students inside in a standoff that lasted 17 hours. While the student demands for a stop to tuition increases, the reinstatement of 38 custodial staff that had been laid off and negotiations on a fairer more transparent system of governance for the UC system were not met, they did prevent any arrests of the students occupying the building. The action and the heavy-handed response of both the police and the UC also had the effect of galvanising student and worker groups. A nationwide strike to defend public education on March 4th 2010 was observed across 32 states and a follow up is scheduled for the 7th of October. With no Mark Zuckerberg in sight ready to bail them out, California’s students are having to take action into their own hands to make sure that public education remains in the hands of the public and acts their interest; not that of private individuals and corporations. It is remarkable that in what is purportedly one of the richest countries in the world, students are being forced into such positions to defend public education while the state has to rely on hand outs from millionaire philanthropists looking to improve their public image. Humza Tahir is an academic and activist. He is a post-doctoral researcher at UC Berkeley and reports for Ceasefire on US affairs.